In the very large town that is modern day Gippeswic, the shortlist of eateries still to visit seems to always hover around the half-dozen mark. 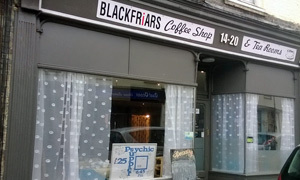 New 'uns spring up -- eg The Mermaid, car park heaving on a grotty Thursday lunchtime -- dead 'uns threaten to reappear -- eg K's Coffee Lounge, signs of life visible today -- while others, like Prince, decide to change their names. Such is the case with Ladies That Lunch: takes more than that to stop us manly chaps taking our luncheon there. LTL is dead. Long live Blackfriars, pictured advertising a "psychic supper". Lucky us nabbed a one hour parking spot outside and went in to be confronted by the sound of two ladies knitting. Bring us cake and wine! Cutting this short, much is as it was, even from the viewpoint of the other window table by the radiator. Still with the basic options of panini, jacket and sandwich served with coleslaw and crisps on white oblong plates. Still with the white square china tea cups. Still resembling your aunt's living room. Also, still with the view of Dedham Place: does that really says Growlers Passage underneath? Still with quality homemade cakes. And still with a good cup of coffee to finish. If it was a car -- Black Maria.